The Harrisburg Area Transportation Study (HATS), the designated Metropolitan Planning Organization for Cumberland, Dauphin and Perry counties, adopted the Regional Transportation Plan update on December 14, 2018. The RTP documents the current status of the region’s transportation projects and programs, identifies long-term needs and recommends projects to meet those needs. It also sets a framework and priorities for the expenditure of federal transportation funds over a 25-year period. and environmental resources and mitigation. 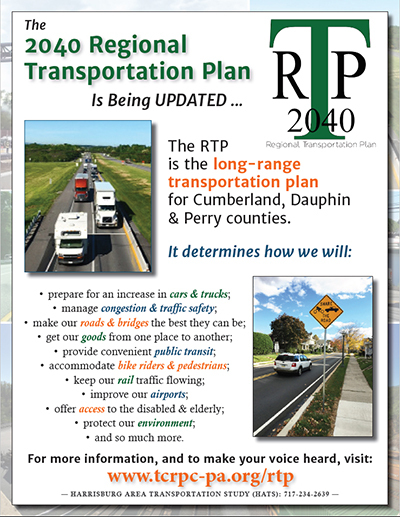 The site also features a section on the RTP’s performance and progress, as well as a contact page where you can reach out to us with questions or comments about the plan. We invite your active engagement in the RTP process. In addition to Cumberland, Dauphin and Perry counties and their 103 municipalities, HATS works with federal, state and local agencies and officials from throughout South-Central Pennsylvania, including the City of Harrisburg and Capital Area Transit, to meet the transportation needs of an area covering nearly 1,700 square miles. In 2017, HATS’ lead staff agency, the Tri-County Regional Planning Commission, began updating the RTP with an all-new, dynamic approach. HATS staff, with assistance from seven advisory groups comprised of various local stakeholders and experts, reviewed the region’s current transportation system and developed key recommendations to address its long-term needs.